My husband, it can be stated without hesitation, is a guy who knows what he wants. For his birthday, which happens to fall on Memorial Day weekend this year, he was given the choice of what to do over the long weekend to celebrate his special day. No restrictions…anything he wants, I'll do my best to accomodate. No "trip to Paris" crossed his lips, no "dinner at _________" restaurant. Without hesitation, he answered, "Brisket." You see, Dave is a guy who loves his smoke. 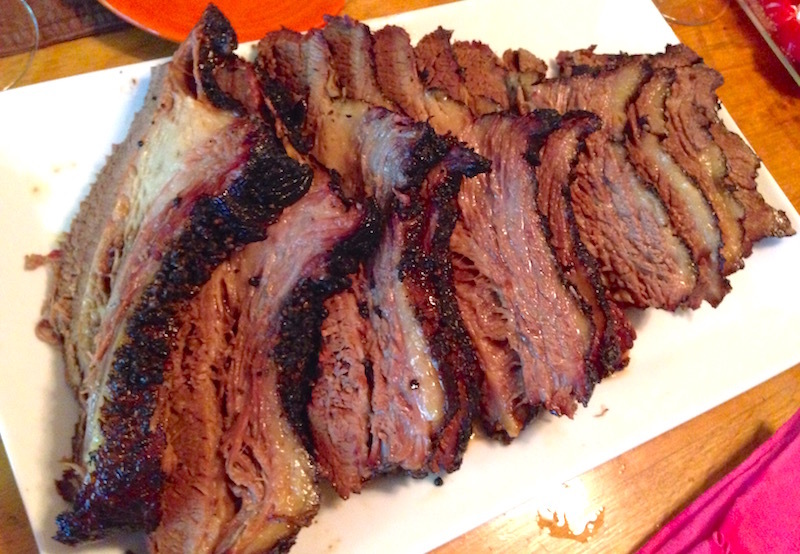 The last brisket he made (left) used a method called the "Texas crutch" where the meat is first smoked for several hours, then wrapped in butcher paper and returned to the smoker. After a few more hours, it goes into a cooler to rest and break down any remaining collagen that has withstood the battering of heat, smoke and time. At the end of which emerged the most succulent, tender and delicious hunk of meat he'd ever made. Ayers Creek Farm borlotto beans. The pressure to come up with appropriate sides then lands on me. My fallback is always my mother's potato salad, a family favorite that pairs perfectly with smoky protein. 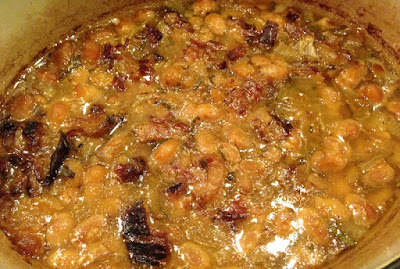 I was struggling with what else would be appropriate when I remembered a baked bean dish I'd made a couple of years ago that had the slightest bite of vinegar, an Italian-inflected version based on a recipe from contributor Jim Dixon. So the menu is set, and if you want updates I'll be posting photos of the results to my social media feeds (Twitter, Instagram and Facebook). But if you're simply want to make the baked beans for yourself this weekend, you can find the instructions below. Put dried beans in a pot and add water to cover by at least 2”. Cover and soak overnight on the counter. Drain water from beans and add fresh water to cover by 1”. Add bacon, bay leaves, salt and olive oil. Cover, place in oven and bake 5 to 7 hours until beans are tender (a slow cooker would work well, too). One hour before the end of the cooking time for the beans, combine the onions, honey, vinegar and sage in a small saucepan and simmer for 1 hour. When beans are tender, add onion mixture to them and combine, then bake for an additional hour. Remove the bay leaves. Remove the piece of bacon and slice it into pieces or shred it, then stir it back into the beans. Taste for salt and adjust as desired. This is great served right out of the oven but is also spectacular made a day ahead for dinner or a picnic the next day. * My last batch had quite a bit of liquid left after cooking, so I simmered it on the stovetop for several hours, uncovered, to evaporate the liquid, stirring it occasionally to keep the beans from sticking. It worked like a charm, and the liquid turned into a luscious, beany sauce. Their color couldn't scream spring any louder. And with a delicate, earthy flavor and creamy texture, these little beans are like little nuggets of gold. 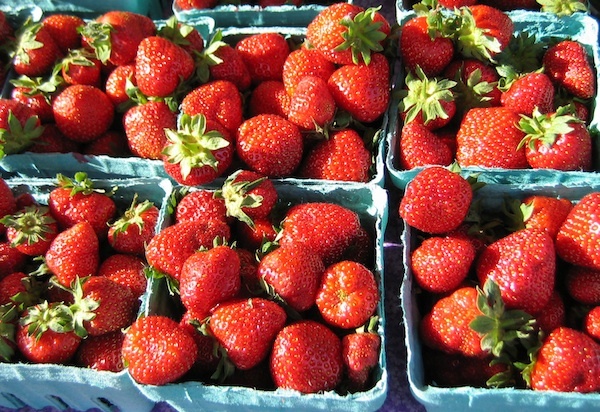 Add in the labor of peeling them from their skins, and they're elevated to the level of food fit for the gods. I like them boiled whole in salted water, popped from their pods and tossed with good olive oil, a sprinkling of mint and a whisper of garlic and salt. 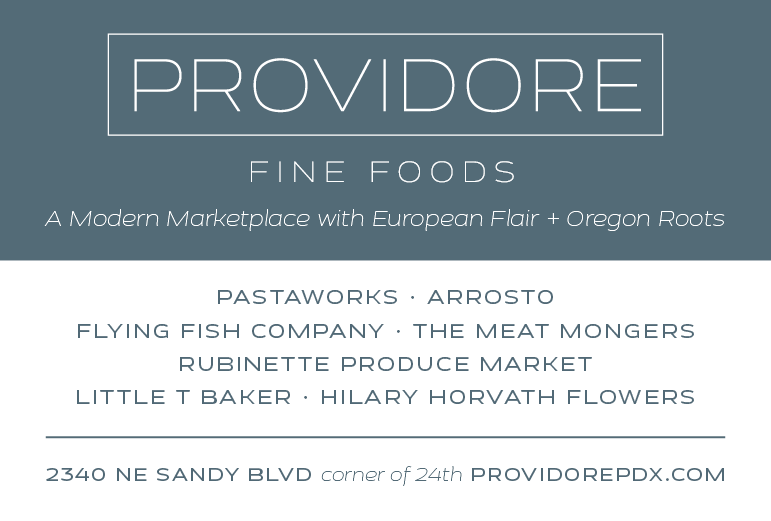 Contributor Jim Dixon of Real Good Food likes them whizzed into a spread for bruschetta. While favas have been cultivated for at least 8,000 years, nobody's figured out an easy way to get them out of their skins. 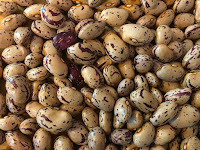 Of course, for most of those millenia, people left the skins on the beans, and my friend Nancy Harmon Jenkins makes a good case for doing just that. [Her very funny post is well worth the read. - KAB] But other cooks I like argue convincingly that the time and labor spent is worth it. 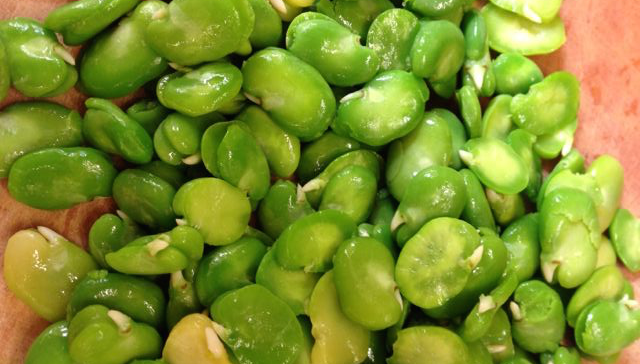 Whether to skin your favas depends on how you plan to eat them. 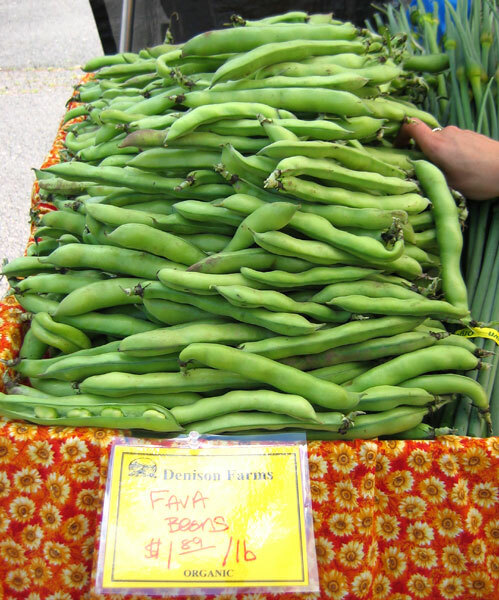 American farmers tend to let them get too big, but if you grow your own or can find small favas (pods thinner than your finger, with beans about a half inch long), spend a sunny afternoon acting like a Roman. 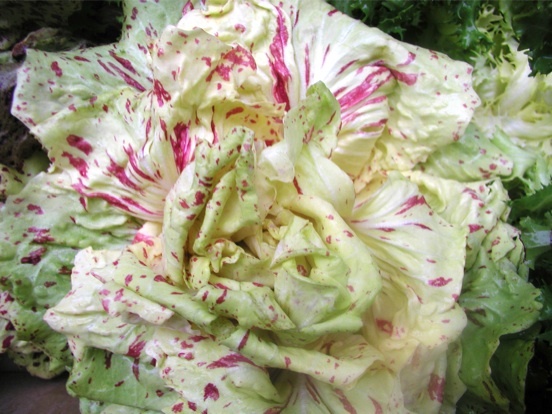 Shuck the beans and eat them raw with a some good pecorino (sheep's milk cheese) and a crisp white Vermentino. Or make the classic Spring vegetable stew called vignarola. 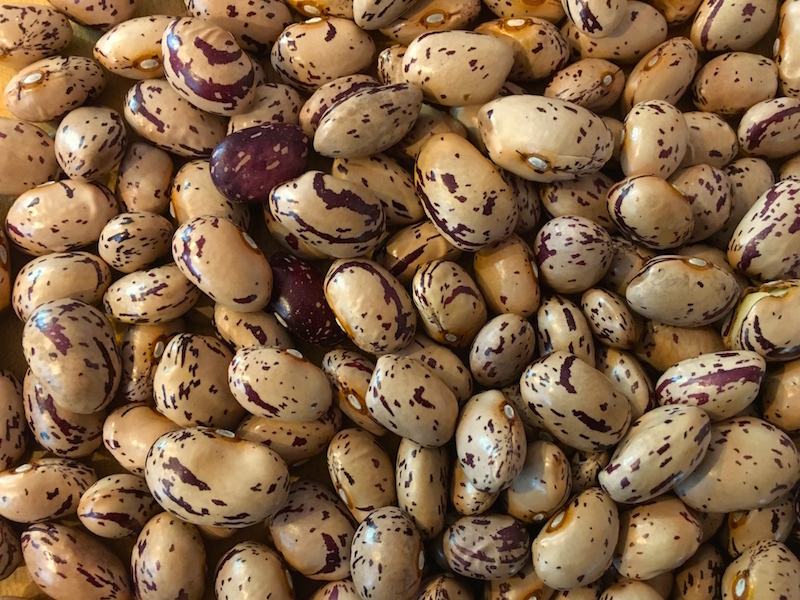 Traditional versions leave the beans unpeeled, but others [like this one from Chef Cathy Whims of Nostrana] call for naked favas. Making a spread with favas is one of my favorite ways to get more out of the time spent dealing with them. Sometimes it's just a few ingredients, like this one with mint and garlic. 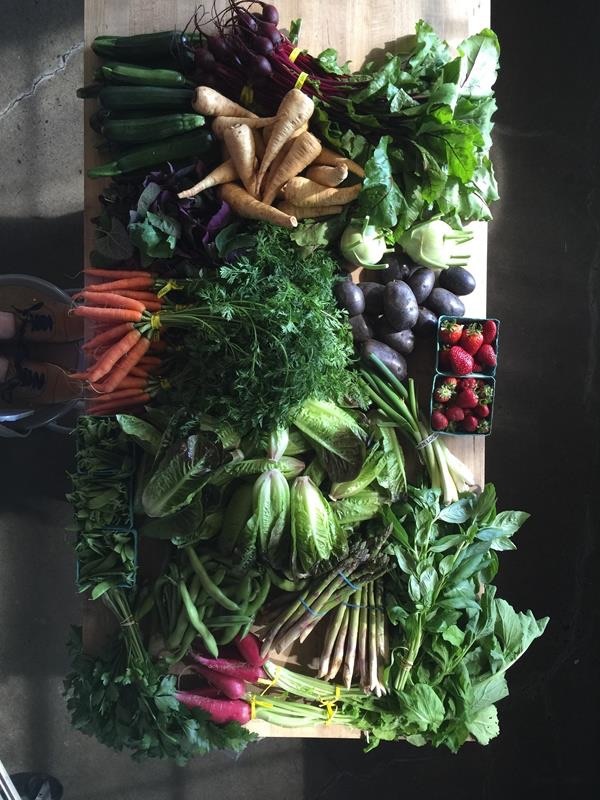 But if I need to feed more than a few people, I'll add a few more things. 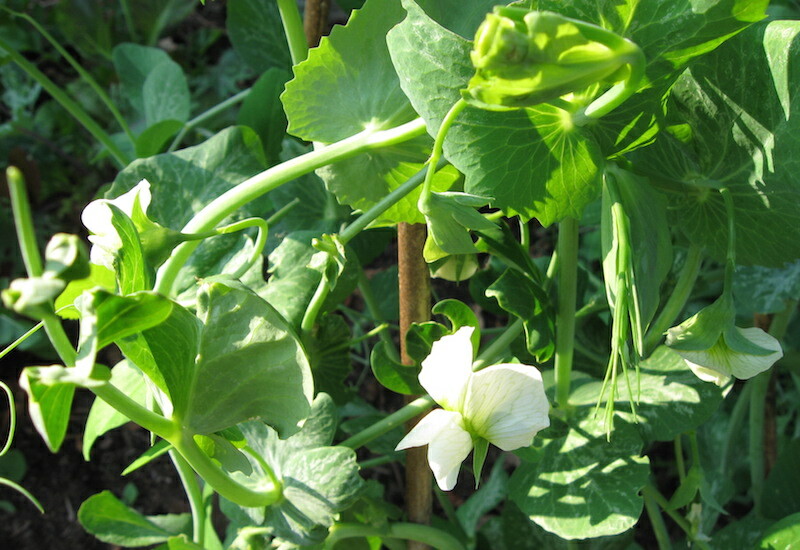 Start with pound of favas in their pods. 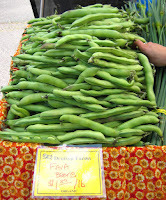 Split open the pods, remove the beans and drop them into a pot of well-salted boiling water. Cook for about a minute, drain, and run some cold water over them until they're cool enough to handle. Use a fingernail to nick the skins and squeeze out the bright green bean. You'll end up with about a cup of shelled beans. Combine them in your food processor with a cup or so of fromage blanc (or other soft goat cheese), a few tablespoons of pecorino Romano, a couple of cloves of chopped garlic, about 2 cups of arugula, a half cup of fresh mint, a couple of pinches of salt, a splash of Katz Viongier Honey vinegar and 3-4 tablespoons of extra virgin olive oil. Process until you have a coarse puree, taste and add salt, vinegar or oil as necessary. Toast or grill some good bread, drizzle with a little olive oil and top with the fava spread. Sometimes I see a recipe that's so unusual it begs to be made. It's usually simple—I'm not the kind of ambitious cook who loves devoting hours of labor to a project—and the fewer the ingredients, the better. Throw in low risk, and I'm in! So when I read my friend Hank Shaw's description of curing egg yolks in salt, I was intrigued. 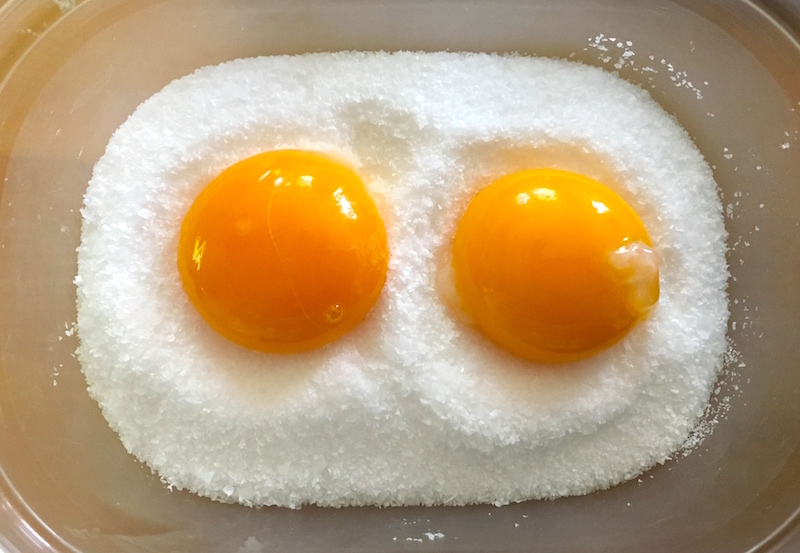 Two ingredients, egg yolks and salt. And time: a couple of weeks. 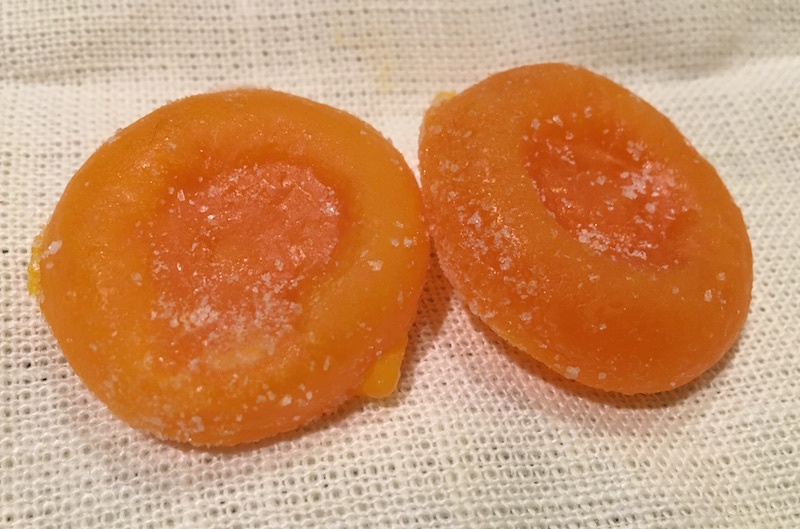 And voilà…two small, moderately hard, slightly gummy pucks that, when grated, taste like salty, eggy parmesan, only richer. Unctuous aged cheese, if you will. And if you're using eggs from pasture-raised chickens—a trip to the farmers' market should be enough—the color from those tangerine-tinted yolks is going to be brighter than marigolds in the sun. 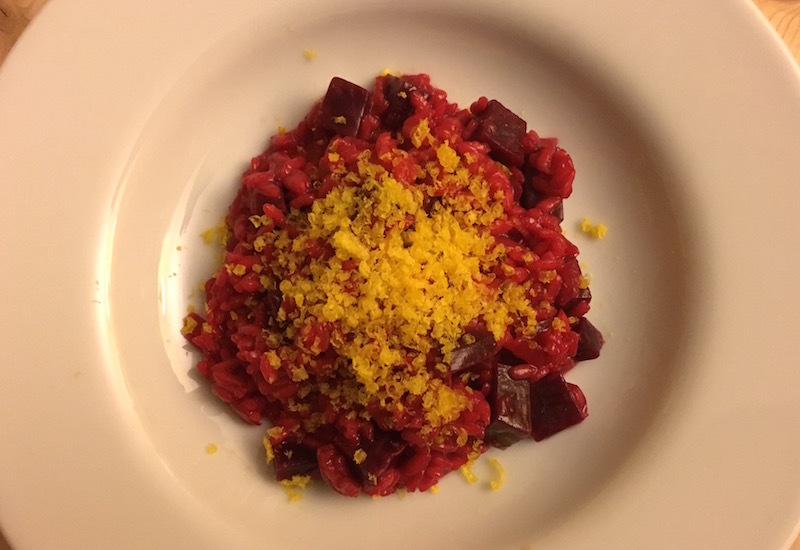 Sprinkled over beet risotto (recipe). Hank says they'll keep for a year wrapped in cheesecloth in a sealed plastic container, so next time I'll make a half-dozen. Grated, the two yolks I cured came to about half a cup, enough to sprinkle over four servings of risotto (right), a pound of pasta or a good-sized Caesar salad. All of which I'm planning on trying very soon. 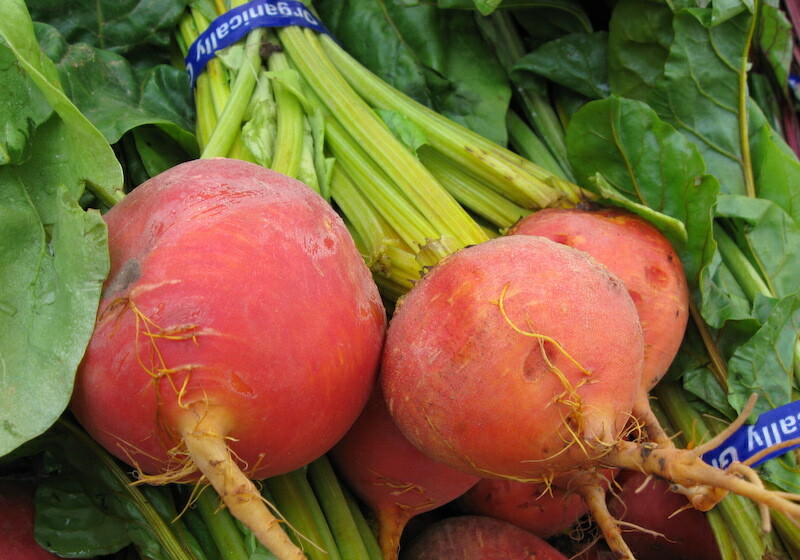 Here's my recipe for the beet risotto pictured above right. Watching and waiting are hallmarks of farming, and contributor Anthony Boutard of Ayers Creek Farm has been observing the great horned owls' nest in the stand of firs near their home for months. Though they are wild creatures with lives beyond domestication, a certain attachment occurs over time, and this week brought a poignant moment. 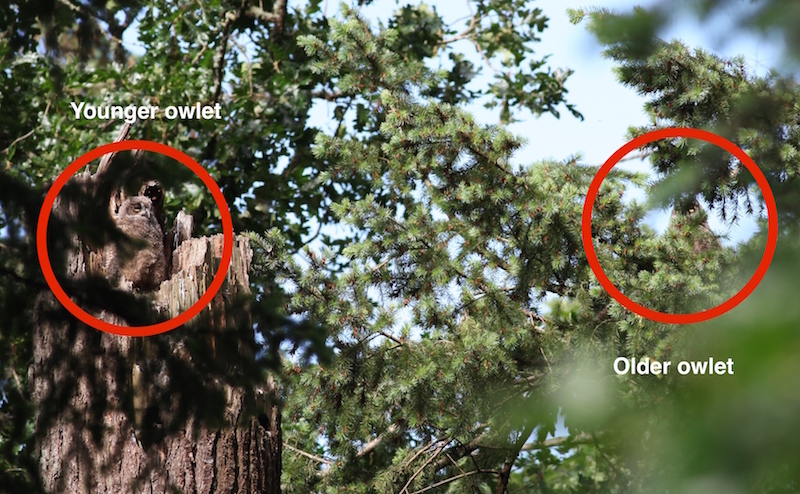 As the Bard said, "parting is such sweet sorrow…"
The last couple of days it was obvious that the owlets were about to depart. The eldest was perching atop the snag, and even the younger bird was standing tall on his legs. In the morning twilight, as I watched the older bird surveying the neighboring trees and exercising its stubby wings high on its perch, I knew they would leave. By the time the sun moved above Bald Peak and there was enough light for a good photograph, there was just one in the nest. In the photograph you can see the older owl tucked into the fir boughs (top photo). Once they can perch on a branch, they are ready to leave the exposed setting of the nest. It will be a few weeks before they can attempt flight, and months before they can do so gracefully. At this point they are essentially arboreal penguins. The movements are nothing more than hop-and-flop. During the next month, they will build up their flight muscles and grow in their primary feathers on their wings. It will probably be a while before we catch a glimpse of them again. They are hyper-furtive at this stage. This year we have a raccoon skulking about so life is a bit more hazardous. When I returned from St. Paul in the early afternoon, the nest was empty. They will perch close together and very quietly, no keening or other activity to draw attention to them. This is the first time since the 21st of February with no owls atop the snag. That urine-splashed redoubt will have no significance to the owls, no sentimental returns to the old homestead. 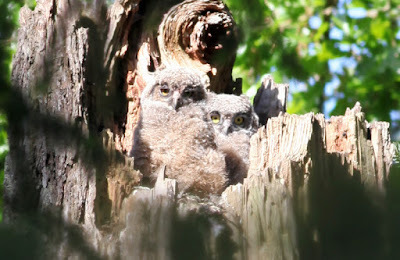 They will remain safely tucked in the fir boughs closer to where the red-tailed hawks nest. A doubling of the raptor watch duties perhaps. 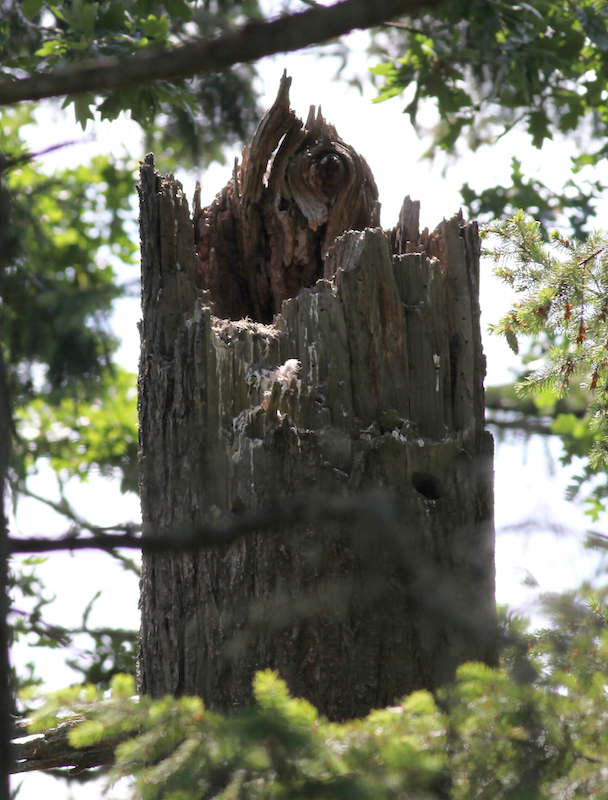 The snag remains a Grand Hotel of sorts with cavity nesters still raising young. A second brood of starlings is in the hole beneath the nest. 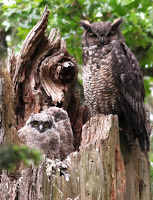 The young owls will leave the farm in the late autumn. Sometime next February, the hen will settle down for another reproductive vigil. Sasha Davies is a cheesemonger, restaurateur and co-owner with her husband, Michael Claypool, of Cyril's at Clay Pigeon Winery. She's also a fine writer, having authored two books on cheese, The Guide to West Coast Cheese and the Cheesemakers Apprentice. Her newsletter for May struck a chord with me, as I hope it will with you. Liminal: (adj.) Of or relating to a transitional or initial stage of a process. Occupying a position at, or on both sides of, a boundary or threshold. You have all experienced liminal time, the kind where you're somewhere between a Here and a There. This can be very much a matter of logistics, like being on an airplane, or slightly less well defined like the time between making a decision (to move, take a job, have a baby, take a trip, quit a job, commit to/end a relationship) and the first moment where it feels like that decision is manifesting in the world. Liminal times can be tense (picture yourself straddling a fence) and uncertain—filled with anxiety about what's coming—they can also be times of great release and letting go, or leaning into a spot of blank space. The liminal nature of May—the month—is something I feel every year here in Portland, and I can see it play out in our kitchen at Cyril's; I sense that the rules of Here (spring) and There (summer) are malleable. This feels somewhat liberating. Part of this could be because I grew up in California, where May felt much more like the beginning of summer than the midst of spring. When I moved here eight years ago (in April) and didn't see the sun on a regular basis until July 5th, my idea of spring got entirely rearranged. The early warmth and sunshine this year has shattered my ideas about May yet again. Personally, I find this time of year to be one of the more challenging of the seasonal transitions. While I do find the green shoots and kaleidescope of blossoms utterly delightful, there is a quickening up that I find myself resisting. In subtle ways I cling to the last bits of slowness left over from our winter habits. 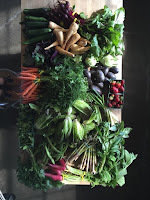 There is an overarching theme of freedom we feel about summer, the season we're barreling toward, and yet in the kitchen—and in my life—sometimes I feel there is a certain pressure about it as well, an unspoken demand that one engages in that time of year with a particular vigor. This is precisely the kind of thing that makes me anxious—you know, because what if I'm tired and I feel like staying inside? 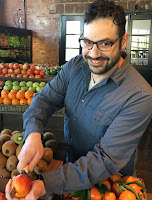 At Cyril's we are doing our best to embrace the liminal nature of now both in terms of what is available at the market and what our guests are interested in eating. The menu feels like a bit of a moving target but somehow this pop of early warmth in the weather has meant a larger overlap of the seasons in terms of ingredients. We only just said farewell to sweet potatoes and risotto and have now created our first salad with lettuce in a starring role. Photos courtesy Cyril's at Clay Pigeon Winery. Spring in Oregon is a flighty thing. She can be wearing a summer dress and flip-flops one moment, then bundled up in fleece and rain boots the next. She's been seen making daisy chains and picking peonies aplenty, but there's just as good a chance you'll catch her stomping through ankle-deep puddles. A Northwest spring is the time for taking the cozy flannel sheets off the bed and putting the heavy sweaters and coats in the closet for next year. But any Oregonian worth her salt knows that even a several-day stretch of warm, summery weather will almost always turn toward the cool and damp at some point, at least until after the Fourth of July. 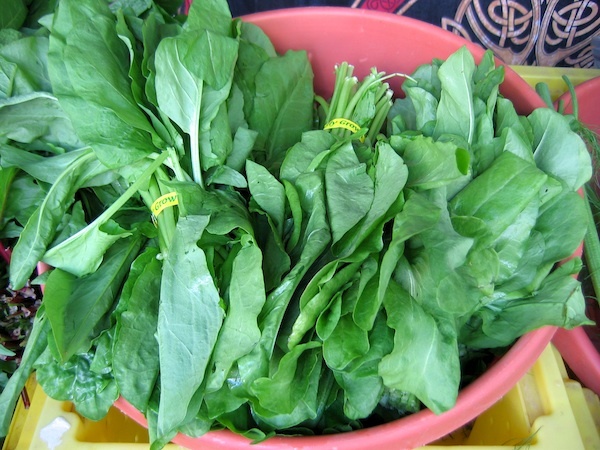 Sorrel at the farmers' market. That's the reason my braising pot is never far from reach this time of year, so I can pretty much whip up a big batch of stew or soup whenever inclement or chilly weather returns. 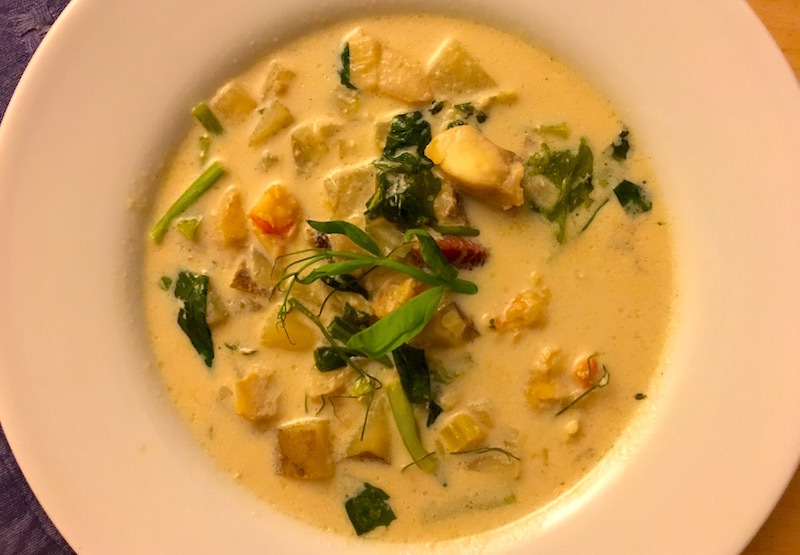 The chowder below is quick and simple, and you can use any fish or shellfish that comes easily to hand. And it's perfectly permissible to substitute chicken, vegetable or corn stock if you didn't boil up your fish bones or crab shells to make fish stock—just make a note to do it next time! The fun thing about making soups in spring is throwing in whatever's growing in the garden—curls of pea shoots, green tips from favas, chard or sorrel that's starting to come back—to give that chowder some color and a little zip of flavor. Slice a few thick pieces of bread for sopping and you've got a meal in a bowl. Melt butter over medium heat. Add onion and sauté until it becomes translucent. Add celery and garlic and sauté till tender. Add potatoes and sauté about 5 min. Add milk and fish stock and bring to a simmer. Add fish, shrimp, pea shoots and thyme sprigs. Return to a simmer and cook for at least half an hour, or longer if possible. 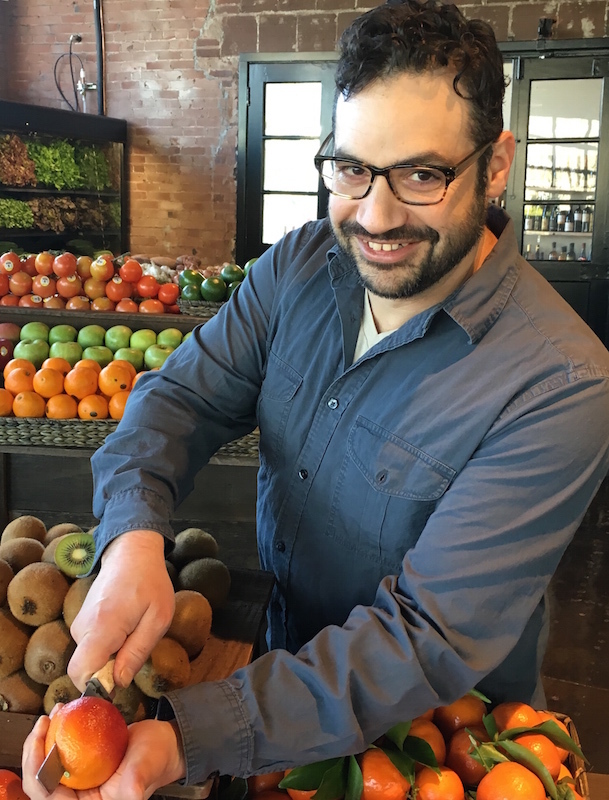 Life Gives You Lemons (and Rhubarb)? Make Cocktails! You know what it's like: It's cocktail hour and a gin and tonic would taste really good, but you're out of tonic and all the limes in the fridge are brown and shriveled. Which rules out a gimlet, a caipirinha or a margarita. 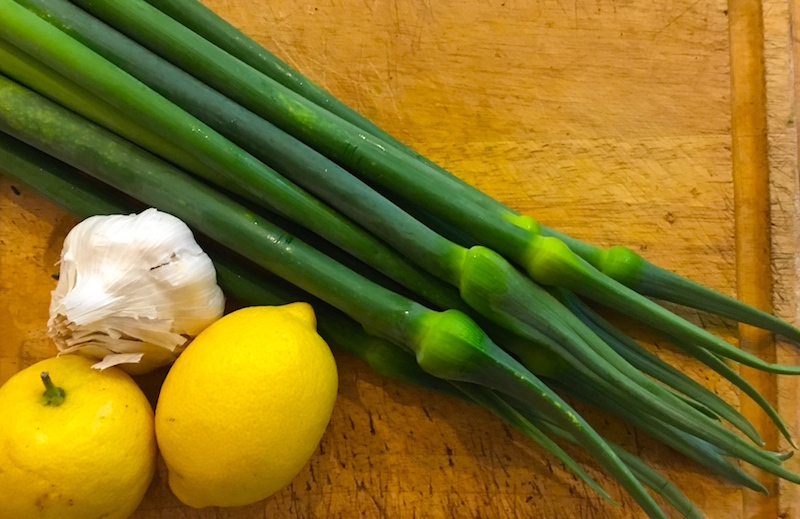 But wait…there are lemons, and you just made a batch of rhubarb syrup so your nephew could have his favorite thing at auntie's house, her fabulous rhubarb soda. Since that was precisely the situation I found myself in the other day, I cast my mind way, way back to the 1990s and what popped into my head was that chichi happy hour cocktail—and the bane of bartenders everywhere—the lemon drop! 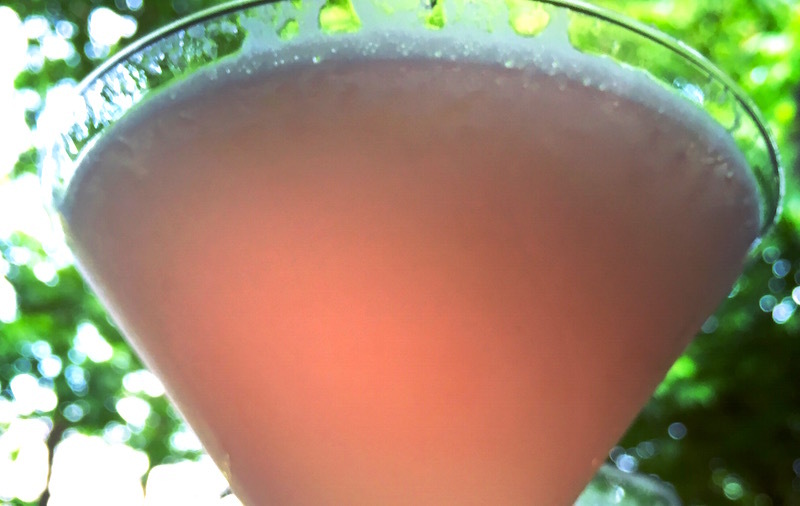 I simply substituted the rhubarb syrup for the simple syrup and, voilà, cocktail hour was saved. Huzzah! For the syrup, wash rhubarb and chop stalks crosswise into 1/2" pieces. Place in saucepan and add water to cover. Bring to a boil, then reduce heat and simmer for 15-20 minutes. Pour rhubarb mixture through a sieve into a medium-sized mixing bowl to strain off solids. Add equal amount of sugar to the strained liquid (you're making a 1:1 simple syrup) and stir until sugar is completely dissolved. Cool. The syrup can be stored in pint jars in the freezer to keep you well-supplied until next rhubarb season. For the cocktail, make a sugar rim on the glass by slicing partway through a wedge of lemon and running it around the edge of your glasses. Make a mound of sugar on a plate and, inserting the edge of the glass into the mound at a 45° angle, twirl the edge of the glass fill cocktail shaker 2/3 full of ice and add all ingredients. Shake 15-20 seconds. 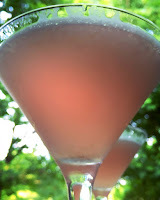 Pour into sugar-rimmed martini glasses and serve. Contributor Anthony Boutard of Ayers Creek Farm sends along a photographic update on the great horned owl pair that has now hatched two owlets in a Douglas fir snag on the farm. So cute!